Malachite’s name may be derived from the Greek word for its colour, malache (mallow), or because of its low hardness, from the Greek malakos (soft). Malachite was known in Egypt as early as 3000 B.C. It was also popular with the ancient Greek and Romans, for jewellery, ornaments and, in powdered form, for eye shadow. 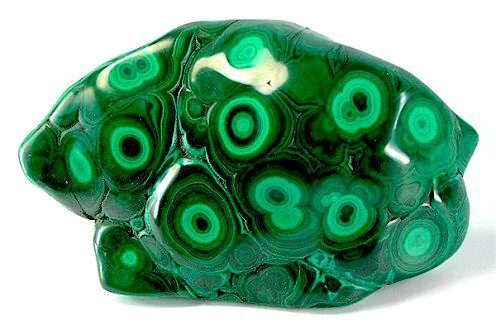 In the Middle Ages, Malachite was believed to protect against the evil eye and to cure various types of stomach ailments. The Russian czars used Malachite from the large deposits in the Urals to produce ornaments and panelling for their castles, as well as intricate inlay work. Malachite is one of the most important stones for protection from negative energies. It permeates the auric field with positive vibrations and strengthens the natural energetic ‘shell’ which can screen out hostile forces. It activates the psychic ‘radar’ via which one ‘feels’ the presence of danger. It offers a ‘cloak of invisibility’ which can keep one from being noticed by those who might pose a threat to one’s emotional or physical well-being. It even accentuates the vibrational equivalent of ‘luck’, in which synchronicities seem to conspire to keep one safe and protected. It assists one in maintaining emotional balance, in which one remains in a positive, benevolent state but is not tempted to take on the emotional baggage of others. IT also offers an enhanced ability to see where one’s own emotional traps and pitfalls lie, and to avoid them. The solar-plexus chakra is also stimulated by Malachite, and in this case, there is an enhancement of willpower. In the presence of Malachite, it is easier to refuse all sorts of temptations, and in so doing, to realize one is also serving one’s own highest good. Malachite instils confidence and self-responsibility and is useful in making spiritual progress through right action in the world. The energy of Malachite strengthens our ability to take action in the world and to create form from our thoughts and ideas. Its energy drives one to create and manifest one’s desires and dreams. Malachite carries the frequency of the enlightened leader. It assists those in positions of great responsibility to carry out the Will of the Divine without ego-based motivations. It can help one to ‘step up to the plate’ and take confident action. It can help one find the resolve to overcome difficulty ad the integrity to stay true to one’s direction. Malachite reminds us that we are cocreators in this world and that the possibilities for our creations are endless. Malachite can be a powerful ally for those who are trapped in waiting for their reality to change. It can assist one in perceiving the cracks in the walls that block one’s progress, so one can utilize one’s will to break through limitations, barriers and apathy. It stimulates one’s higher passions for life and creating. It lends one the strength to consciously won one’s responsibility in forging one’s life in whatever form one chooses. Malachite can be used to draw out impurities, densities and attachments in the energy field. Its frequency ‘melts’ constrictive energy patterns in the aura and stimulates an energized flow of life force throughout the aura and body. Malachite reminds us that we have come here to cocreate with the Universe and that fate is an illusion. It helps one recognize and utilize one’s power in a constructive, creative manner. It can be used as a grounding tool and will assist one in identifying the steps necessary to bring dreams, visions and wishes into physical reality. It reveals energetic and emotional boundaries and helps one honour those boundaries for oneself and others. It can be a powerful stone for protection from power abuse on psychic, energetic and emotional levels. Malachite is ideal for burning through the fog of emotional confusion that can prevent one from making conscious choices. It helps one overcome the abuser/victim polarity and find strength within oneself. Malachite can assist those who have many creative ideas but are unable to organize or act upon them. It is an excellent ally for those afraid to use their power because of past experience with abusive individuals. It can assist one in overcoming fear of confrontation or fear of self-expression. It can help those who fear being seen or noticed, of who resist assuming their rightful place as a cocreative force in the Universe. Malachite can assist in restoring strength and vitality after illness and in rebuilding or repairing tissue after surgery. It supports the formation of red blood cells and haemoglobin – assisting with oxygenation of the body and overall vitality. Malachite is excellent for reducing inflammation due to sprains, strains or other injuries. It can help draw toxins from the body and can be used to support fasting, detoxification and other cleansing rituals. It can help alleviate the pain of arthritis or other inflammatory disease. It is a wonderful aid to digestion and it stimulates stomach and colon function.